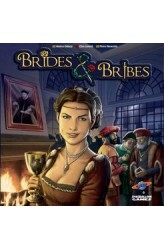 In Brides and Bribes, a strategy game played over six rounds, each player takes the role of a powerful family of Genoa. Carefully employing your family members, each of whom has a unique ability, is the key to your success. Each round, you plan send your family members to the Genoese boroughs to hire new employees, get new workers, and convince the local lord that your family is worth a marriage with his beautiful daughter. If you want to succeed, you have to send the right person in the right place. Hire the most skilled people, intermarry with the most powerful families, poison your enemies, and increase your commercial empire! https://youtu.be/kVGVLzRWDmw ..